So a few days ago you’ll have probably noticed that I published a review for my brand new project, Blog & Bank. Well, I actually published the review a little hastily – and it went live before Blog & Bank was actually launched, or should I say “finished”. As a result I noticed quite a few of you decided to dive right in, sign up & get involved – which was awesome. However, what you probably noticed is that some bits were still a bit of a working progress at the time. Which is why I’m putting this post together today, to give you an update as to what’s been going on & to let you in on something I noticed which has gotten me super excited about this project, and the movement it’s going to create. P.S. If you haven’t already joined, then now’s definitely the time for you to join. Let’s just put it this way, you absolutely, definitely & undoubtedly need to be in on this… And you certainly don’t want to miss out. So click here to join (update: sorry, no longer accepting new members) if you haven’t already before we go ahead & get started. The biggest that wasn’t completed at the time of the me publishing the review was the Fundamental Training Modules, but I can confirm that these are now 100% completed, and have been added to the back office of B&B. So you now have Set Up Training, Start Up Training, List Building Training & Making Money Training. 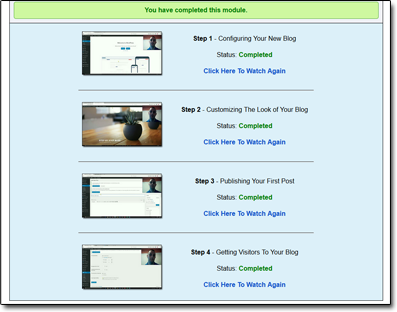 These modules are basically designed to take a beginner & show them how to set up their blog step-by-step and teach them the fundamentals of making money. I’ve purposely kept this modules as simple as possible, whilst at the same time trying to offer massive value. I feel it’s important not to overwhelm people as they first come in so that they end up suffering from information overload – I want to welcome them, and build them up step-by-step in a friendly manner. I feel that many other systems & training programs are too quick to throw jargon & advanced training at people, so whilst this might be a longer process, I feel it’s definitely been done in a way that will help people much more overall. And already within just a few days of entering pre-launch I’ve already had some amazing feedback from new people getting plugged into the system, which has gotten me really pumped. I’ve put countless hours into building this, and those handful of comments have made it all worth the while, so for those of you that reached out – I’m super grateful. On top of that, I’ve began putting the Advanced Training Modules together. Now these haven’t been completed, but they’re getting added bit by bit (and believe me I’m working very hard on getting them done). The Advanced Training Modules will take you from where you left off in the Fundamental Training and will build you up bit by bit to becoming an Advanced blogger/marketer & generally an all-round better make money online person (yes, I just invented a “thing” LOL). 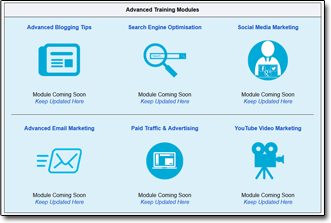 The Advanced Training will consist of Advanced Blogging Tips, Search Engine Optimisation, Social Media Marketing, Advanced Email Marketing, Paid Traffic & Advertising, and YouTube Video Marketing. With the Fundamental Training, you’re forced to complete it in a step-by-step manner. This is to make sure you follow through the training in the right order & so that you don’t end up clicking from video to video & confusing yourself – because confusion is one of the biggest reasons people give up. With the Advanced Training, things will be laid out step-by-step but you’ll be free to roam around it as you please. The reason I’ve done it that way is because by the time you access the Advanced Training after completing the Fundamental Modules you should have a general idea of where you’d like to start. The other big update to report was the fact that I’d put together a 6,000+ word step-by-step guide which as a member of Blog & Bank YOU can code with your affiliate links & promote! I feel like that’s something that will truly help people take their incomes to a new level, and I’m also going to be adding a feature that will enable you to convert it into an eBook to hand out too. Minor changes include things like changes to the funnel for better conversions, additional income streams being added so that you can earn more & just a whole bunch of general changes to provide an all round better user experience. As soon as I’d completed the Fundamental Training Modules I ran a bit of traffic to the Blog & Bank homepage to trial it out & see how it performed. At the time of doing this the funnel hadn’t been optimized whatsoever – I’d just pieced it together as “best guess”, since at this point I had no live-data to go off. So with that in mind I wasn’t expecting to see any kind of great results. I was simply running the traffic to get a basic idea of what the users did as they joined, so that I could then use to data to better improve the funnel & the overall experience. But the results totally shocked me… I’d never seen engagement like it! And the main thing I was worried about was the conversions – sure it’s okay getting people in and through the steps, but getting them to make purchases is a completely different story, and with me being relatively new to creating video I was a little bit worried. However, without meaning to sound like I’m blowing my own trumpet, I think I can say that I nailed it! People just love to see somebody who’s actually REAL… It seems to be a breath of fresh air for them. So despite my videos not being the best quality or perfectly presented, people are engaging with them because they can see that I’m just being ME. And that’s what Blog & Bank’s all about… I wanted to create a system that finally provided people actionable advice that they could take away and implement to build a REAL online business, as opposed to the typical “get-rich-quick” type systems which promise the world & fail to deliver. Sure, no doubt there’s going to be a lot of people that get into Blog & Bank and never lift a finger, but for those that do I want to give you all the information you need to be able to build a booming successful business online – and I’m going to put all my efforts into achieving that. It’s going to help you. My main aim was to create a system that would truly help people, and to not only to help them learn, but to help them earn too. And based on the results I seen from the small amount of traffic I ran, I really do think I’ve achieved that, and I really do genuinely believe that Blog & Bank is going to help so many people become very, very successful online. 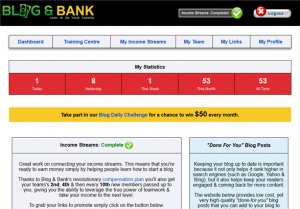 Newbie or veteran, Blog & Bank is going to help you start up & take over. I have a VISION and I’m going to make it happen. Plus, the other amazing thing I added to Blog & Bank was a rotator, which means the new members coming in are getting positioned under YOU. The rotator helps those who are just starting out & gives them a boost so that they can grow their team much quicker & leverage the power of teamwork. If you don’t know what a rotator is, it basically means that if any new members land at the Blog & Bank website without coming through somebody’s referral link, then they’ll get positioned under a random Blog & Bank member as opposed to being positioned directly under myself. Blog & Bank quickly came from nothing to something, and whilst I’ve done so much to it already, there is still so much I’ve got left to do. You can take it from me that it’s only going to get better and better and better. One of the HUGE things that’s coming soon is the ability for you to code a 37-page eBook with your affiliate links, meaning that you can give away a free jam-packed guide and earn money off the back of it. That’s going to be something that will massively increase conversions & commissions so you definitely want to be excited about that. But that is literally just one of the many many ideas I have floating around in my head, and believe me I have a LOT. Thankfully you don’t need to worry about any of that, all you need to do is get plugged in, go through the training, and get yourself pumped up ready for some next level shiz & an awesome year ahead! If you’ve visited Blog & Bank and tried it out then I would absolutely love to hear what you think – whether it be good or bad. Obviously I’d prefer to hear good things, but constructive criticism is absolutely welcome too, because I’m open to hear about anything that will help me make this project even more awesome than it already is. All you need to do is leave a comment below & I’ll keep my eye on this post to stay up to date. I’ll be very appreciate of any & all your feedback!